How to decline a job offer due to salary. How to reject a job offer politely email. Sample letter declining a job offer after accepting it. How to decline a job offer over the phone. How to turn down a job offer but keep the door open. Job offer rejection letter due to personal reasons. How to decline a job offer but leave the door open example. I am writing this letter to first and foremost thank you for the job offer that you gave me earlier this week. As soon I received your recommendation letter I must say I was over excited thinking how much I would be able to grow in your firm as a Floor Manager. But furthermore upon reading the recommendation letter I went through the salary package you offered me, and therefore I must unfortunately decline your job offer. Respect aside but I don’t think I deserve that low of a salary package considering my past experiences in my line of work. No hard feelings at all. As flattered as your board thought I am competent enough for this job I cannot accept the offer. As a fresh graduate I applied to many job offers after completing my internship and I am thrilled that few companies like yours have found an interest in my application. But now when I evaluate all my offers other companies are offering me more perks for the same job position that you are and I would like to go with one of them. Accept my apology for any inconvenience that I may have caused. It is to inform you that as I have been selected for sales manager post but I can’t join your company due to this much less salary package. I have 2 years of experience and according to my experience this salary package offer is not acceptable. I’m sorry for that. Sample letter to reject or regret for accepting work offer. Letter to reject business offer, letter to reject partnership offer. Hope you find this in good health. I recently gave an interview for the job mentioned in your company and two days back I got the call telling me that I was qualified for the job and was asked if I wanted to join from coming Monday. I said yes without giving it much thought but now I am thinking I may have said it too soon as I got job offer from another company with more benefits and as for now I would like to work for them .Grateful for your time and consideration. I am writing from New York’s Company. As recently our company had accepted your offer to launch your brand with the help of our advertising in TV. I am really sorry that our company is having second thoughts due to which we are rejecting your proposal. I hope you agree with our decisions. Sample joining report format for employee, new employees, teachers, professors, students, engineers, doctors etc. Joining report is compulsory in multinational companies and company with larger business network as as surety of employee joining to issue the salaries, benefits and getting the work performance reports. In pursuance of services, General Administration & Coordination Department notice no…. dated…, I have joined post of the Director General today i.e on …date… The charge report is also enclosed. In compliance of office order no…. dated…., I beg to submit my joining report today on date…. as Teacher , UK Office. In pursuance of office order note …. dated…, I hereby joined my duty as Manager Sales at Amazon Uk Branch today on …date.. Sample office orders for appointing employees or notice of appointment of new employee for other departments of the company or branches, banks etc. With the approval of the competent authority Ms. Kristen, I superintending engineer is hereby ordered to look after the work of director (finance & accounts) UK branch with immediate effect and till further orders. Ms. Kristin superintending Engineer, is hereby ordered to hold the charge of Director Finance, UK Branch with immediate effect in addition to his own duties. With the approval of the competent authority, the services of Mr. Umer, assistant, hawks bay, earlier appointed subject to anticipation approval for creation of post in the budget, is hereby adjusted against the clear/vacant post of superintendent available in the UK office with effect from the date of approval i.e. date. I would like to bring it to your knowledge that my wife was suffering from brain tumor. I have already discussed this matter with my head of dept. I was on a leave for month as she was is the hospital and I have to be there for her. She had gone through a major surgery and after that another surgery, doctor had asked me to keep her under strict observation for at least a month With the blessing of GOD she is out of danger and doctors has allowed her to go back to the house. She is on her medication and we have hired a maid for her. It was a great favor of yours that you understood my problem and cooperated with me. I am back on my duty now and will try to cover all the work left behind. I have almost some half of my work. 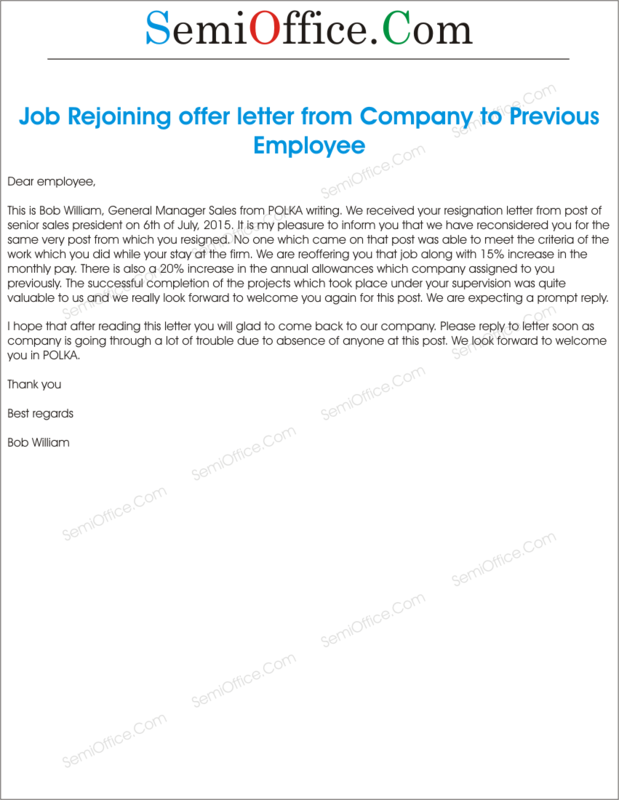 Letter to a recent employee offering him to rejoin the Company or firm based on some new terms and conditions and increments in the salary and other benefits. 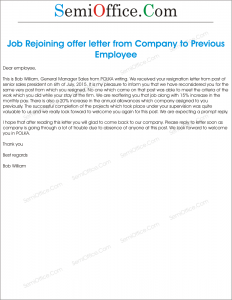 Sample of best Job rejoining offer letter to teacher, principal, director or headmaster etc. Our college would feel an honor if you would rejoin our college as a director. As due to some misunderstandings you left your position two months ago, after which we realized that you had a large contribution in the success of our institute. So we request you to rejoin our institute for betterment of the institute and its students. This letter is to request a rejoining as inventory manager in our company. You had asked a leave for your maternity period of two months which is almost going to end within two weeks. We request you to rejoin our company as inventory manager. As our company is very satisfied from your work and wishes to have eligible people like you. You would be given all the comforts that are given to such lady employees after this period within the employment contract. You may leave the office after the lunch time. You can take leave for any appointments from the doctor for you or your child. Pick and drop services in case of no conveyance. You may also bring the newly born child to office if you think appropriate. This is Bob William, General Manager Sales from POLKA writing. We received your resignation letter from post of senior sales president on 6th of July, 2015. It is my pleasure to inform you that we have reconsidered you for the same very post from which you resigned. No one which came on that post was able to meet the criteria of the work which you did while your stay at the firm. We are re-offering you that job along with 15% increase in the monthly pay. There is also a 20% increase in the annual allowances which company assigned to you previously. The successful completion of the projects which took place under your supervision was quite valuable to us and we really look forward to welcome you again for this post. We are expecting a prompt reply. I hope that after reading this letter you will glad to come back to our company. Please reply to letter soon as company is going through a lot of trouble due to absence of anyone at this post. We look forward to welcome you in POLKA. I hope you are doing great in health. I am writing this letter to you from BDS (company’s name), I am working there as project Manager, Mr. Naeem Abbasi has told me about your work and experiences, and I am really impressed after hearing your all records. Sir I want you to join our company. I will send you the details about the company and projects. Please give me your feedback on that and also tell me whether you want to do work with us or not. I hope you will not reject this offer as we will offer you the best salary package too. I am writing to you because I would like to discuss your service. I have just started my own business and company. The type of company it is we offer peoples the chance to restart their life after a natural disaster such as tsunami or typhoon. We give them the chance to get a new home or help them rebuild their old ones. Most of the time they want new ones in which case we send our scouts out to look for the right area and try to come up with a deal. However in the case of them wanting to rebuild we don’t necessarily have the man power or resources to do that. This is because we have just started this company. I would like to offer you the chance to work with me and my company as I need your type of services and skills to give people a better home. If you would like you have a temporary contract to see, if you like the company and the work. I would love to have you be a part of the progression of this company’s future and progression. I hope you will consider this and I look forward to hearing back your response.